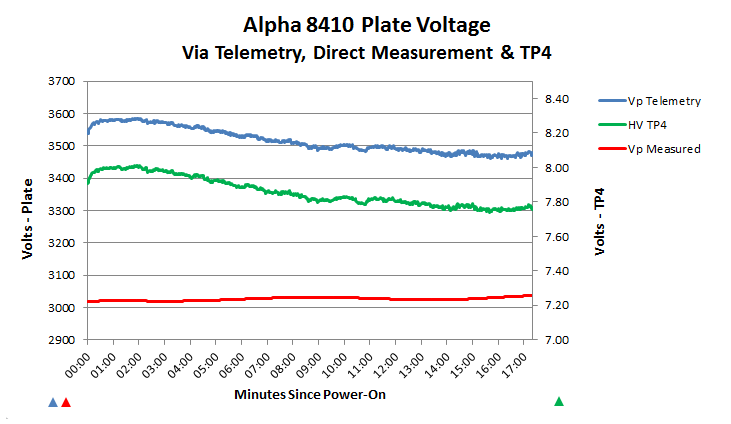 If the monitor software appears to be reporting abnormally high plate voltage, it may be the HV metering resistors. The monitor is just displaying the telemetry sent by the 8410. My 8410 routinely reported via telemetry that Vp was around 3.6 kV when the amp was idle. That didn't seem right considering that's 600 V over spec for the tubes and right at the limit of the HV capacitor string. I noticed in the December 2012 RF Concepts newsletter that there were issues with higher than expected HV values causing faults in the 9500 and these were resolved by replacing the HV metering resistors with ones capable of dissipating more power. As it turns out the 8410 shared the same HV metering resistors. From what I was told by Kathy at RF Concepts, amplifiers manufactured before October 2012 used Vishay Dale RN65D-1004F resistors for the HV metering circuit. Afterward, the amps shipped with VIshay Dale RNX-3/4 1M0 FK resistors. The former were capable of dissipating 0.5 W @ 70 C whereas the latter can dissipate 1.4 W @ 70 C and 2 W @ 25 C.
As far as I could tell in operation the resistors will be dissipating about 1 W each. The effect of the 0.5 W resistors on HV metering was a thermal drift in resistance and thus the high voltage values reported via telemetry also drifted. If you suspect you have the RN65D-1004F resistors, they're easily identified by just removing he cover from the amp. To see where these are located and the process to replace them, see the HV Metering Resistors page. I used a HV probe and a calibrated Fluke 289 to directly measure the plate voltage while simultaneously recording the telemetry-reported HV and measuring the voltage on test point 4. TP4 is the output of the HV metering resistor voltage divider and is used as a DAC input to arrive at the telemety-reported HV values. As you can see, telemetry was reporting much higher than the actual (measured) Vp and the telemetry wandered significantly while the directly-measured Vp was very stable. After the resistors were swapped the results were quite different. The most apparent difference is the stability. No wandering as the resistors heated up. 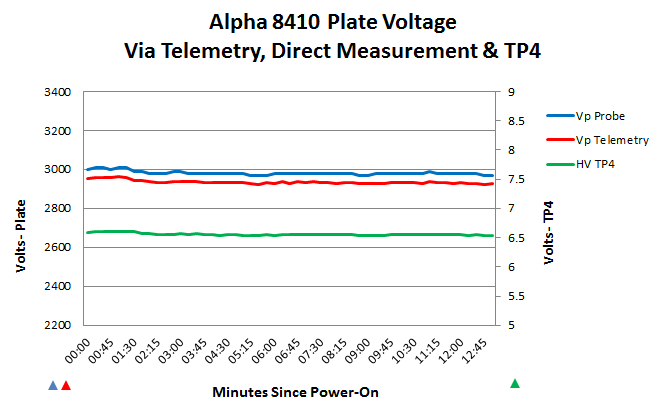 Second, and to me the most important, was the extremely tight correlation between the measured plate voltage and telemetry. The average offset between the two was just 45 volts. For most 8410 owners this difference is insignificant and can be ignored. I added an option to the Alpha 8410 Monitor program for a configurable plate voltage correction value. This allows you to enter the measured and reported values on your amp and the monitor program will apply that ratio to incoming telemetry for correction. Replacement resistors are available on the RKR web site here.